The twenty-six sides which go to make up this recording are not the easiest to remaster. In his notes for the Naxos 2002 issue of the recording, Mark Obert-Thorn wrote: "Although recorded over a five-day period on twenty-six consecutive sides by HMV, this legendary abridged version of Der Rosenkavalier poses many problems for the restoration engineer." And a few days ago he confirmed this to me by e-mail: "my source discs ... came from about a half-dozen different copies (Victor Z, Victor Gold and Electrola), none of which was perfect all the way through. I had to use sides from each of the copies I had to do the transfer..."
The Naxos edition is of course still in print, and offers the prospective purchaser an alternative to this new XR-remastered release. Naturally both of our approaches at the remastering of a recording such as this are quite different in many respects, and I've been able to take advantage of a number of significant technological advances which were simply unavailable to the restoration engineer as recently as seven years ago. Although my discs, which were a near-mint set of British HMV pressings, were in very good, clean condition, the effect of using XR to open up the top end - and it really does open up, with vocal harmonic extension at times reaching up to somwhere in the region of 10kHz, roughly double the expected frequency response for a set of 78s - is to reveal a plethora of other shortcomings in the discs which might previously have remained hidden, most prevelant of which on a good number of sides was the dreaded swish. Swish on discs is a problem for which, until recently, there was little or no solution. The current state of technology, in 2009, is that we can either ameliorate or, often, completely 'zap' each swish in such a way that the music remains untouched. The downside of this latest technology is that one has to process a swish at a time, which on a recording of this length means over 9000 individual selections and interventions purely to tackle this issue. It's a laborious task, but one which I believe yields results which are worthwhile. What you'll hear in this remastering is a sense of openness and clarity which has perhaps not been heard before in this recording. I've opted for as light a touch as possible with hiss and noise reduction - always a difficult balance to strike with a recording of this vintage - but I think the results speak for themselves. Mark Obert-Thorn notes in his previous restoration a considerable variation between sides with regard to balance between soloists and orchestra and overall levels. I felt perhaps less aware of this after the re-equalisation of the recording in XR remastering, beyond the occasional sense that a singer may have taken a step closer to the microphone at one point or another - something which is to be expected in a staged opera, if not a studio recording. As such I let this pass, and did not attempt any adjustments of levels or perspective. It's a marvellous recording - and one which I think this XR remastering manages to shine a refreshing new light on. Recorded almost eighty years ago it is remarkable how much information was hidden on the twenty-six shellac sides. In his technical notes on the Pristineclassical website Andrew Rose claims to have opened up the top end of the frequency range to somewhere around 10kHz through use of with the use of XR technology. That’s ‘roughly double the expected frequency response for a set of 78s’. The risk is that there are also hidden shortcomings, primarily ‘the dreaded swish’. Today it is possible to eliminate swish without affecting the music - but it has to be done one swish at a time and on this set it is a question of more than 9000! Obviously it’s a very laborious task. Eight years ago Naxos issued this set, restored by Mark Obert-Thorn; also on Andante. Since then there have been important technological advances. Unfortunately I haven’t had access to that earlier set, but I have several snippets from this legendary recording on various LPs and the difference is amazing. First and foremost we hear so much more of the orchestra. The introduction, so magically scored, now unfolds with a clarity and richness of detail that one couldn’t have dreamed were inherent in the old shellacs. The velvety strings of the Vienna Philharmonic caress the ear with marvellous warmth and the pizzicato playing in the introduction to act III is extraordinarily well-defined. The delicious final bars are also pin-point clear. The voices are well defined and even though dynamics are limited compared to more recent efforts there is an overall quality that should make this issue attractive even to those who normally are allergic to historical recordings. The performance in itself is a true classic and it has been hailed uncountable times. Let me just add to the laurels heaped upon it with a few personal notes. It is heavily cut, so heavily that it is not even an abridged version but ‘Selected passages’ as the header correctly states. The whole reception scene in act I is gone, thus also the Italian tenor’s Di rigori armato. Great portions of Baron Ochs’s boisterous behaviour in act II are also cut as well as much else. An uncut performance takes a little more than three hours; this one plays for 98:26, not 118:26 as stated on the inlay. In other words about half the score is cut out. What remains offers what is indubitably the best of the opera, very much concentrated around the four leading characters. Of these Richard Mayr, who was nearing the end of a more than 30-year-long career and died only two years later, was a little past his best. His tone had dried out compared to what he sounded like a decade earlier. He was however the Ochs of his time in Vienna, where he sang in the first performance on 8 April 1911. By 1933 he had chiselled out a many-faceted portrait that made the character less bullish, more likeable than he actually is. Whether this is good or bad is open to debate. 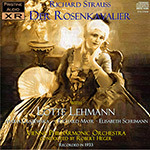 Lotte Lehmann and Elisabeth Schumann, arguably the two best sopranos in the Austro-German repertoire during the years after WW1, were still at the zenith of their careers. Both incidentally were born the same year, 1888, and thus in their mid-forties. Lehmann has never been surpassed in the role of Feldmarschallin – though Elisabeth Schwarzkopf was her equal. Hers is a portrait of deep insight and sensitivity. Schumann is possibly the most charming Sophie ever and though there are imperfections – the odd note off-pitch, some exaggerated portamenti – this is negligible in the face of such identification and loveliness. Maria Olszewska’s Octavian is not quite in their class. She sings well and her round and darkish tone is well contrasted to the two sopranos’ but as an interpreter she is anonymous, compared to some later singers of the role: Christa Ludwig, Yvonne Minton, Frederica von Stade and Anne Sofie von Otter. That said, in the duets and trios she is a rock-solid complement to the lighter and brighter voices and the finale is a vocal treat from beginning to end. Robert Heger may have been an able rather than extraordinary conductor, but he seems to have been particularly fond of this score and draws lovely playing from the admirable Vienna Philharmonic. No one who loves this music can afford to be without this recording and with the new-dimensional sound that Andrew Rose has conjured up from the old records there is further reason to procure this pair of Pristine Audio discs.